Create your own set by selecting and mixing with each other your favorite plates. MAREMORO FEELS LIKE WATER, SALT, FIRE AND WIND. We could begin by telling you that Maremoro produces extraordinary, handcrafted Sicilian ceramics by following ancient traditions which transform an artisan product into a design object. But Maremoro has much greater ambitions than that. Through its ceramics, Maremoro tells stories that reveal Sicily, its colours, its flavours and its fragrances, creating furnishing accessories with a typically Mediterranean style. With Maremoro you are not simply buying a unique Made-in-Italy piece you are bringing all the charm of Sicily into your home. Our “Young Lovers” capsule collection of Moor’s Heads was created to exalt love, and it is from love that it takes all its colours. Create your own custom set by selecting and mixing our flat, soup, dessert and small plates. Set of plates for 2, 4, 6 and 8 people. Each service is complete with flat, soup and dessert plates, made and decorated by hand. 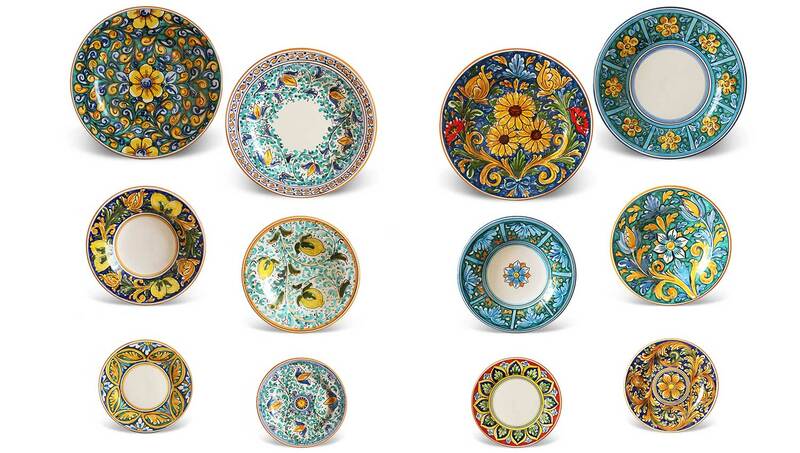 Our Caltagirone decorated ceramic bowls, with a diameter of 12 cm, complete the service of Sicilian plates. Available in two sizes: the smallest measure 25 cm in diameter, the largest 30 cm . 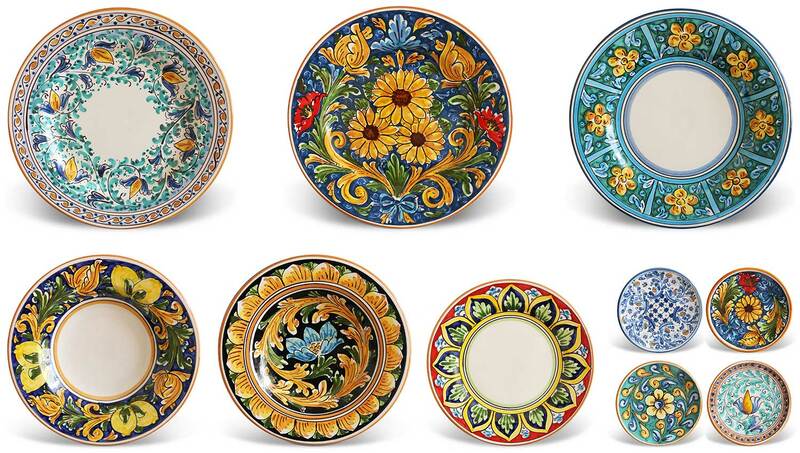 The excellence of the tradition of Caltagirone ceramics enclosed in a new and original octagonal shape. An elegant new collection of plates decorated in black and grey. A product dedicated to those who love tradition given a contemporary twist. 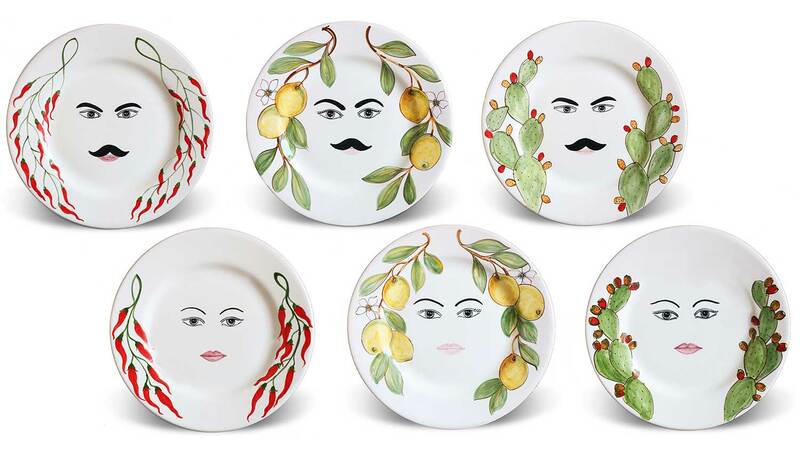 The decorations of our moor heads have been adapted for this pop, colorful and unique collection of plates. Available in different sizes: large, medium, small and mignon. 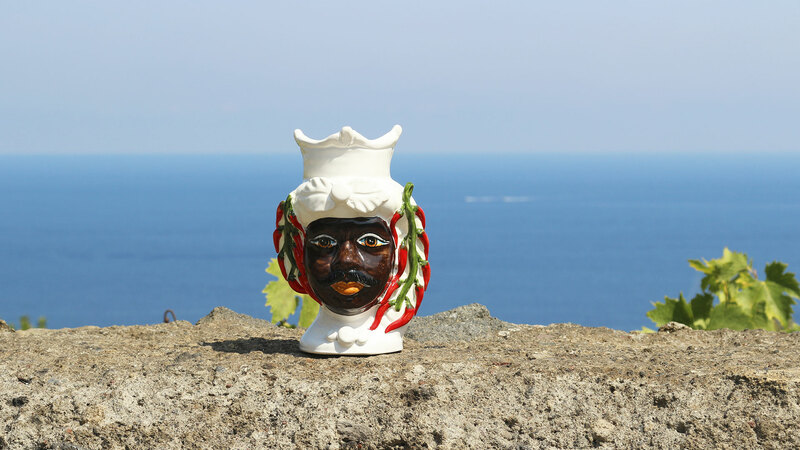 With our moor heads you will let your home enter the flavor and magic of Sicily. 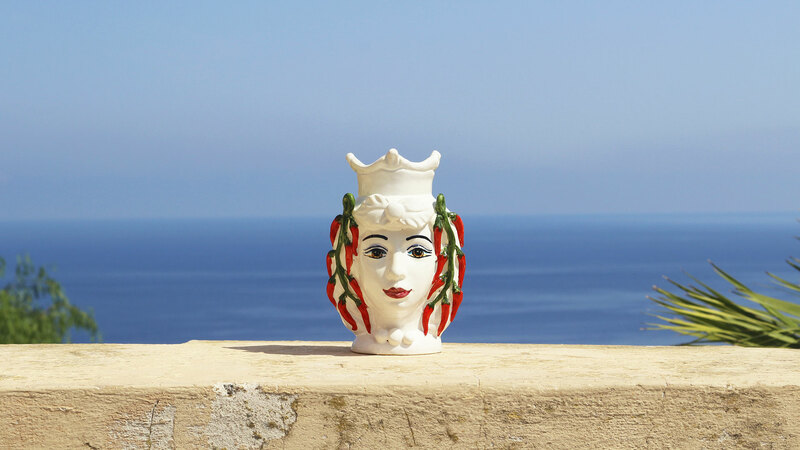 The tradition of Sicilian ceramics revisited in a modern way. Unique furnishing accessories with a modern and urban-minimal design. It is in Caltagirone, where beautiful sunsets colour the sky and the houses, that we create our artistic ceramics, entirely hand-decorated in full respect of the most ancient tradition. 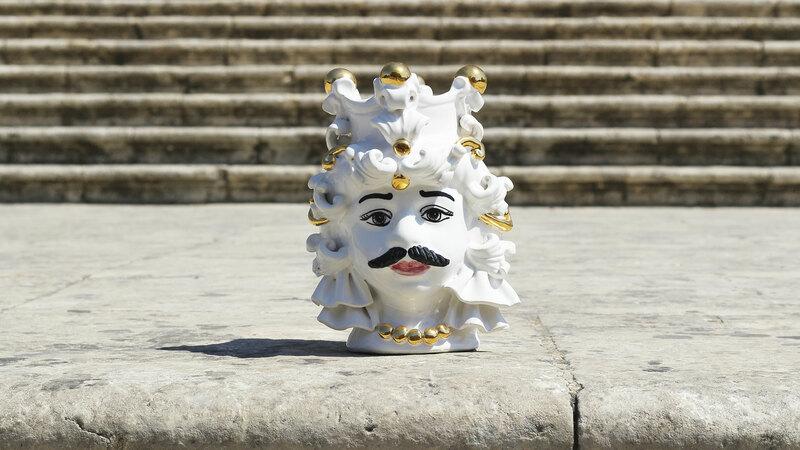 World-renowned for their artistic and cultural value, the ceramics of Caltagirone are unique artefacts which achieve their most perfect expression in Moor’s head vases. Our Moor’s heads are the emblem of this place, with a soul that smells of the east, of citrus and of chillies. 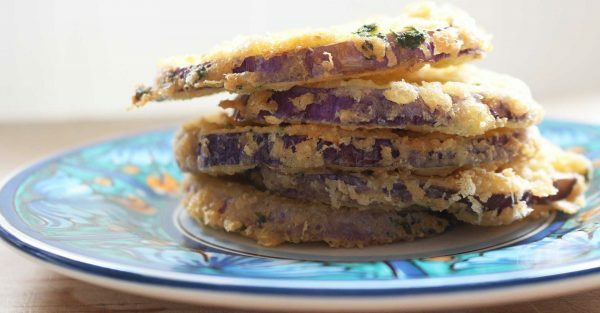 Dressed in gold and embellished with flowers and prickly pears, they are a little vain, and they describe their homeland in the way only true Sicilians can. Some are haughty, some are lavish and some love simplicity, but all are eternally in love with their island, and their modern design captures all the flavour of Sicily, with its decorations dense with tradition as well as a touch of contemporary urban style. LET YOURSELF BE INSPIRED BY THE STORIES OF OUR PRODUCTS AND YOU WILL FEEL ALL THE ENERGY OF OUR BELOVED SICILY FLOWING THROUGH YOU. 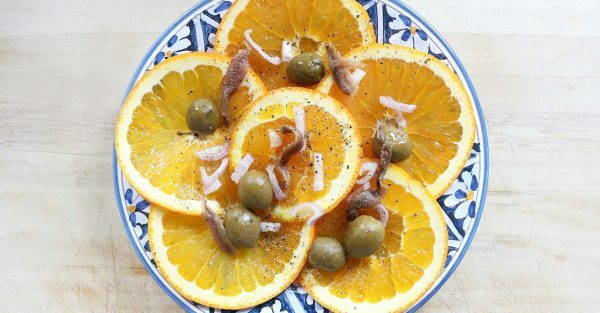 Our Caltagirone ceramics are unique because each one tells a story, and each story is a tangle of life and flavours. There is Ninella, who lives on the island of Salina in a white house with a vegetable garden. 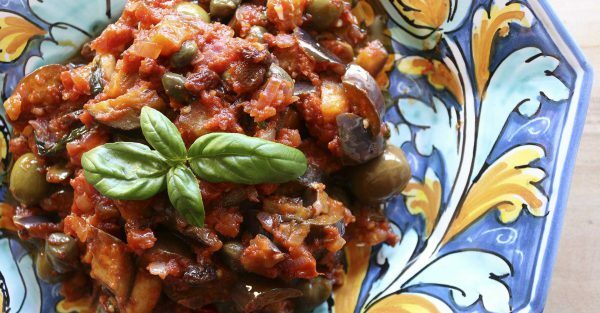 She loves spending her days among the spicy chillies, juicy capers and freshly picked tomatoes in her kitchen. Every night she sits in a wicker chair and watches the sunset kiss the sea. Not far away, in Alicudi, lives Carmelo. He loves travelling, even though he never actually has, and spends his days writing love poems while he looks east to Salina. His words wash back and forth across the paper, following the movement of the tides. By day he loves to dry chillies in the hot sun and at night he counts the stars in the sky while he waits to find his own. 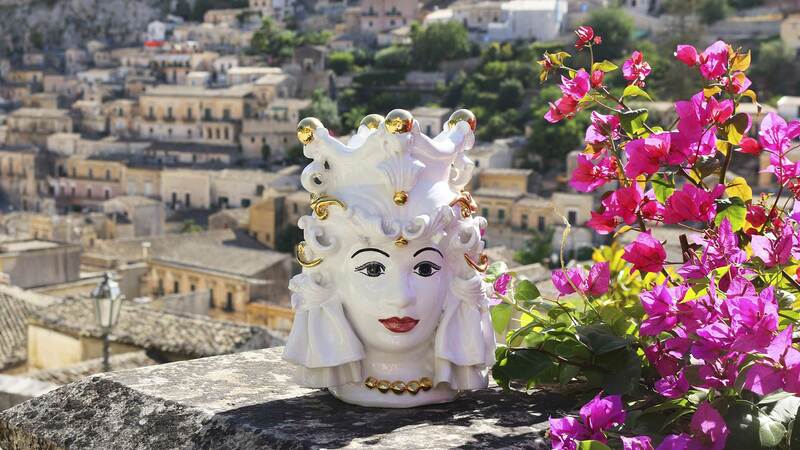 Nora lives in Modica, and has a terrace which overlooks the town and fills the air with the perfume of her flowers. She makes delicious sweets with the local chocolate. She is vain and sometimes theatrical, and each night she savours the beauty of her town when the slowly setting sun dresses it in gold. Mimmo lives in Noto. He has a long black moustache and loves ornamenting himself with precious jewels. When evening approaches, the sunset reflected on his face illuminates him with passion and nobility. He lets himself become inebriated by the flavour of his almonds, and is certain that he could prepare extraordinary biscuits with the chocolate of Modica. LIKE SUN, HANDS, HEART AND CLAY. The realization of our artistic ceramics follows an ancient tradition and a complex production process that lasts many days. All Maremoro artefacts are shaped and decorated by hand in workshops where the yellow Sicilian sunlight illuminates the expert fingers of the artisans who skilfully work the clay which is our raw material. Hands that create, eyes that study every detail, the smell of the enamel, the sound of the brushes, the heat of the kilns. In Caltagirone, the days pass with respect for the passage of time. The time needed to create a unique product that evokes art, Sicily, land and fire. 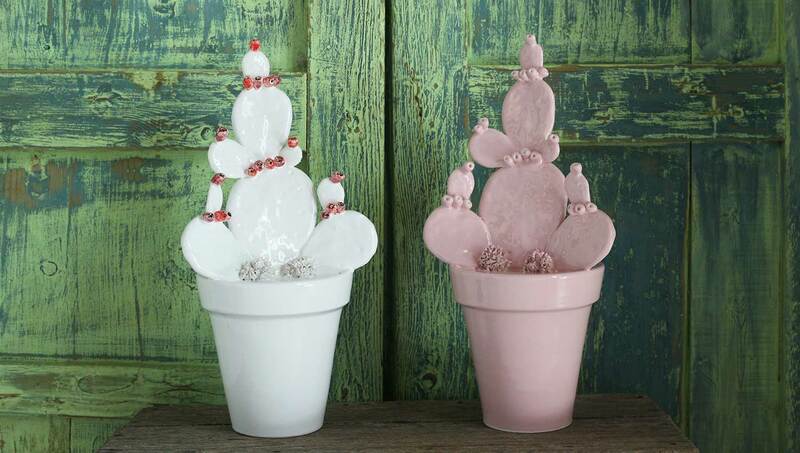 In order to become ceramic and be transformed into magnificent home décor products, the clay undergoes two slow firings. The first lasts about thirty-six hours, the second twenty-four. Those decorated with gold undergo a further firing for about another twenty-four hours. It is the patience needed to wait which is the real secret of our trade – the value that distinguishes our unique handcrafted objects. No Maremoro product is identical to another, so the presence of small differences or irregularities is a sign of the uniqueness which is the result of it handcrafting. By choosing a Maremoro product you bring into your life an objet d’art that will last forever. Legend has it that around the year 1100, when Sicily was under the dominion of the Moors, in Kalsa, the Arab quarter of Palermo, there lived a beautiful girl who spent her days tending to the plants on her balcony. One day, a young moor who was passing by saw her and was so taken with her that he instantly declared his love and offered her his heart. Taken aback by such passion, the young woman did the same, promising him faith and adoration. Soon, though, she discovered that he would soon desert her to return to his land in the East, where a wife and children awaited him. Desperate and in the grip of a crazed fury, she waited for night to fall and as soon as he had closed his beautiful eyes, she killed him and cut off his head, making it into a vase which she put on display on her balcony, planted with basil. Watered every day with the girl’s tears, the basil thrived, arousing the envy of all the inhabitants of the neighbourhood who began having vases in the shape of moors’ heads made for themselves too. 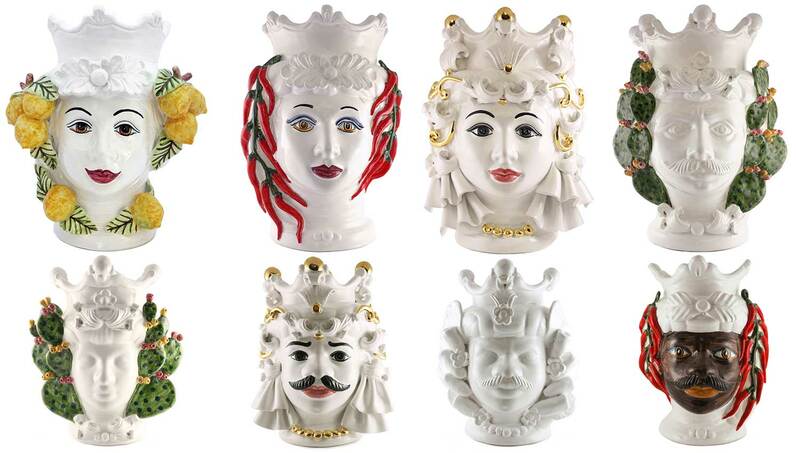 In the realization of our Caltagirone ceramics, feelings of love and passion, skilfully transformed into unique products dedicated to interior design, are more alive than ever. Let yourself be inspired by the stories of our products and feel all the energy of our beloved Sicily flowing through you. In all European countries and U.K.